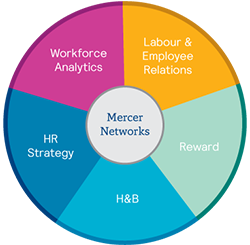 Mercer Networks offer senior-level HR leaders the opportunity to engage with peers in premier, global organisations with focus on current challenges and solutions that will impact results going forward. Discussions are confidential and highly collaborative with ample sharing of information on strategy, recent initiatives and future plans. Each network brings together senior Human Resources Leaders around common HR fields and expertises. For 70+ years, we offered executive peer groups for labour and employee relations and human resources practitioners. These networks allow members to exchange information and interact with fellow members in a confidential environment. The mission of the Networks is to keep members informed and ahead of the curve regarding key issues. The sessions are facilitated primarily by members sharing their experiences and expert speakers adding perspectives. Between sessions, members remain connected via ad hoc surveys and outreach. Networks are 24/7 virtual communities of trusted peers ready to help each other with input on HR challenges when the need is most urgent. We welcome you to attend your first session as our guest without fee or obligation. Upon joining, members pay an annual fee to participate.